The Star GX20IGS Grill Express™ panini press has one section of smooth plates that provide even heating and constant contact with the food. The grooved plate section leaves grill marks on food, enhancing the presentation of any dish. Both sections have heavy cast iron plates to retain heat. The bottom plates have splash guards that contain liquids and crumbs for simple cleanup. The Star GX20IGS Grill Express sandwich grill has a manual thermostat that operates from 175 to 450 degrees Fahrenheit. As the unit heats up, the handles stay cool to protect the user from burns. Accommodates products as thick as 3 in. 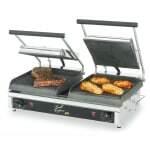 The Star panini press buyers' guide offers in-depth information on Grill Express panini presses.